Does Pauline Marois attack the former leader of the Partis Quebecois, or does she ignore him as irrelevant? Citizens of Quebec and Canada ask yourselves as I have done on many occasions lately, “What was wrong with what we believed in as a country and a people? Was the price of Multiculturalism with all of its demands for equality and inclusiveness, tolerance and justice for all under the law, just too high a price to pay for our politicians and the people of Canada? Politicians such as Steven Harper and Pauline Marois are saying that they are leading this country away from all that we used to believe in, all that we used to practice in our every day life and are changing our core values and that means who we are, because this is what Quebecers and Canadians want. I for one see no major protests, or hear no public outcry saying you are not doing this for me. Canada is getting a new look, a makeover, without consultation and in a very non democratic manner and Canadians sit quietly as we watch the rights and freedoms and values that this great country used to be so proud of get stripped away one by one in every way imaginable, from labor issues to religious freedoms. We look more like the non democratic dictatorships that we seek to educate and bring into the democratic way of doing things, than the respected Canada and safe haven for the oppressed people of the world we once were. It would seem by the lack of protests in the streets that Canadians are indifferent to the changes, or feel helpless to do anything about what is happening? I say it is time to take to the streets in numbers that will tell the likes of Harper and Marois that we Canadians liked who we were and what we stood for before they re-made this country to look as though it was cold, austere, intolerant and environmentally illiterate, or do you feel that the results of the forced changes and Canada’s new look are worth what it has cost us as a people? I was wondering how the Jewish General Hospital was going to be able to handle all of the people rushing to its new emergency facilities with its new see a doctor right away, no waiting policy, now that everything has been advertised on television, but the question has been answered for them, by the Pauline Marois and her Parti Quebecois government. Pauline Marois has directed the hospital to turn away all patients that are coming from off island and redirect them to hospitals and facilities in their own area, no matter the circumstance, with very few exceptions. That Quebec has made each hospital a specialised hospital appears not to matter to Marois, or her Parti Quebecois. Everyone in Montreal knows that the Montreal General Hospital was designated as the trauma care center and that the Hotel Dieu has been designated as the hospital that specializes in heart problems, but none of this seems to matter to Pauline Marois, because she is more concerned that these hospitals do not run out of operating budget monies, because the Quebec economy under her governance has plummeted so low that she cannot afford to give them more monies. It does not matter if you have cancer and the best place to get treatment is in the Jewish General Hospital, you are to be encouraged to seek help closer to your home and die if necessary for her dream of being the Queen of her own country. Ariane Lareau, press attaché to Quebec Health Minister Réjean Hébert, said the goal of the policy is to “ensure that people receive medical services close to their home and that’s what they want.” However, in cases where patients do require ultra-specialized care for a complex illness, “corridors of service will remain open, including at the Jewish,” she added. If with Ottawa’s help, Pauline Marois and her Parti Quebecois cannot survive without (a)cutting hospital and health care to their constituents, (b)provide a way to send students to university and such for an affordable rate,(c)take care of its senior citizens properly and(d)maintain its own infrastructure, then what does it matter what the primary spoken and written language of Quebec is, or will be? 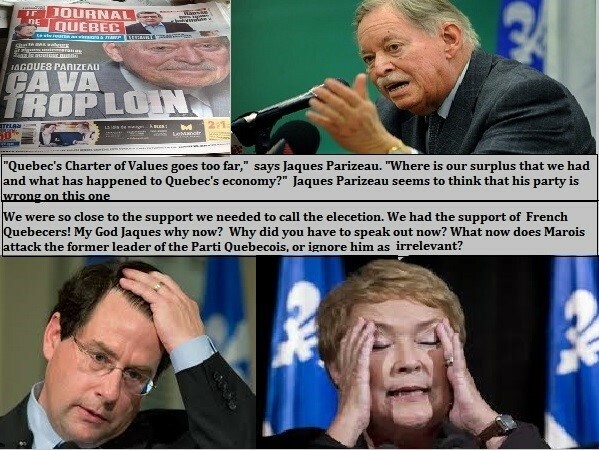 Who but an idealistically driven fool with their head stuck in the sand would think that all these things would miraculously become doable and sustainable if Quebec won its independence as Pauline Marois, the Parti Quebecois and a minority of Quebec separatists keep pushing for? What kind of person cares what religious garments, or symbols people are wearing that serve them in government offices in Quebec, if those persons are courteous and helpful? What kind of person cares what religious garments, or symbols doctors are wearing when they are operating on someone’s dying heart? Would it not be better instead to hope that the doctors and medical team are the best at what they do? What benefit does all of this talk of independence give to the everyday Quebecer if Quebec cannot afford to live independently of the rest of Canada and would still be seeking to look for financial handouts from the federal government like a spoiled child and depend on the federal government to protect Quebec’s sovereignty and its borders? Loss of tourism revenue as people who cannot speak French go to other provinces to vacation where they get served in a language they understand and are not treated as the enemy because they do not speak French. Who wants to vacation in a war zone? Loss of jobs as companies move their head offices and in some cases their whole business out of Quebec. Ability to attract new businesses because of all the added expense in complying to unjust and expensive labeling laws. Ability to control the corruption in its construction industry, because of its self alienation from the rest of Canada limiting its choice of companies to work with. Its ability to take care of it seniors. Its ability to take care of its sick in a timely way that is best suited for recovery from serious illnesses. Higher prices at the gas pump than in most of Canada because the government needs to gouge its population to pay for a civil war that nobody but a few want. Our reputation as a friendly place to live where international rights and freedoms as well multiculturalism and democracy are respected. As well as a reputation internationally as a place where all people are welcome and may live without fear of persecution, because of religion, race, or cultural differences. The safety of citizens due to a total infrastructure failure putting its citizens at risk every time they drive their car over or under a bridge, or a highway overpass, or even on the streets as old tar gives way making sinkholes big enough to swallow trucks and heavy construction equipment. People can’t even eat outside on a restaurant terrace without wondering if they will get hit in the head from falling debris and be killed, because Quebec can not afford to put enough building inspectors on the job to insure their safety. Quebec is not alone it its idiotic single-minded pursuit of one priority for its constituents, the federal government led by Steven Harper governs with the same ideological set of values and principles that are dragging the whole country down into the abyss of constitutional challenges, abysmal economic growth and a no working population that has not been seen before in Canada save for the Great Depression. I speak of the problems plaguing the province of Quebec, because this is where my mother and I were raised and where I have raised my children. The Harper government with their refusal to take advice and with its dictatorial style of governance has single handily turned this country upside down and turned its people one against the other solely for political gain, just as the Parti Quebecois has done in Quebec, but in the case of the government of Canada not only the people of one province suffer, but all Canadians suffer for their ignorance. We are now experiencing record unemployment in Canada, we have the largest deficit in Canadian history and social services are being cut as never before witnessed in Canada under any government regardless of political stripe; we can’t even afford to have our mail delivered to our houses anymore and yet Steven Harper, continues to play the piano, sing the praises of his government and ignore the injustices being perpetrated against the non francophone living in Quebec, the First Nations across Canada and our failing economy. Much like Nero both Pauline Marois and Steven Harper seemed content to lay the blame on others and languish in their misguided feelings of changing their countries as it would seem for the better. This entry was posted in abuse, abuse of power, Canada, Montreal, Quebec, Uncategorized and tagged bigotry, Canada, Canadians, ethnocide, Government of Canada, heavy handed tactics, Montreal, Parti Québécois, Pauline Marois, politics, Quebec, Quebec's genocide, Stephen Harper. Bookmark the permalink.